Family Retreat*Steps to the beach*Free WiFi*Cable TV*AC* Indoor Pool*Gym*Grill. ENJOY your time on Hilton Head Island by staying in our beautiful and comfortable condo located in the oceanfront Villamare complex of Palmetto Dunes, where the beach is less than 200 ft away!! NO streets to cross-just an easy walk out the door, down the hall, down 2 levels via the elevator or stairway, through the beautifully landscaped lagoon and pool area, across the short boardwalk and you are there!! ***NO KEYS NECESSARY WITH OUR KEYLESS ENTRY SYSTEM! The entry code is changed with each renter. Feel more secure knowing you have your own unique entry code assigned only by me! ***NEED A SECOND and THIRD CONDO? WE ALSO OWN 3227 VILLAMARE, LOCATED NEXT DOOR AND 3224 VILLAMARE (OCEANVIEW), DOWN THE HALLWAY!!! PERFECT FOR THOSE TRAVELING WITH OTHER FAMILIES!! *VILLAMARE has a wonderful Health Club FREE TO USE FOR OUR GUESTS with an indoor pool, sauna, and hot-tub, as well as exercise equipment and free weights. Villamare in Palmetto Dunes is the ultimate oceanfront resort vacation spot. Why? Location, location, location! Palmetto Dunes offers something for all ages: walking, running, golf, tennis, boating, fishing, fine restaurants, shopping, or just relaxing with a good book overlooking the Atlantic Ocean. Villamare is situated on the finest beach on Hilton Head Island, within walking distance to more amenities than any other villa area. Located through the private gates of Palmetto Dunes between the Marriott Beach and Golf Resort and the Hilton Resort, you can walk to the world-renowned Palmetto Dunes Tennis Center, the Robert Trent Jones Golf Course, the Fazio Golf Course, the Arthur Hills Course, the General Store, Palmetto Dunes Outfitters (bike, canoe, & crib rentals), and Alexander's Restaurant. You can literally park your car and never leave. RIDE THE FREE SHUTTLE service provided by the 'PALMETTO DUNES BUGGY' with regular stops at Shelter Cove Plaza, Mall and Harbour, the Plantation Center, Dunes House & Palmetto Dunes Tennis Center. CALL THE PROVIDED NUMBER FOR MORE DETAILS! 3226 VILLAMARE is located on the 2nd floor of Bldg.#3, accessible by two elevators or three sets of stairs. Either of these take you down to the pool and out to the beach. ALTHOUGH THIS CONDO DOES NOT HAVE A VIEW OF THE OCEAN, it is just an easy 150 ft. stroll to the REAL THING! Compare our prices with an oceanview condo and you'll see a savings of $200-$500 PER WEEK. SPEND LESS AND ENJOY THE VIEW FROM THE BEACH ITSELF! OR FROM THE BEACHFRONT POOL DECK! *COMPARE OUR DISCOUNTED OWNER RATES AND QUALITY AND SAVE MONEY! We have owned and personally managed these condos for 11 YEARS! We are Linda & Leigh and have owned and personally managed this condo since 2002 along with the help of many local vendors that we have worked with for many years. We take pride in the condition and presentation of our condo and strive to keep it clean and updated with our own personal touches! We have many renters who return year after year! The Villamare complex, located in the lovely Palmetto Dunes Plantation of Hilton Head Island, has everything to offer! It is located mid-island which makes it convenient to get around on Hilton Head Island. The on-site Health Club, free to use by ONLY Villamare guests, indoor & outdoor pools, perfectly landscaped grounds, and beachfront location make it a wonderful place to vacation. 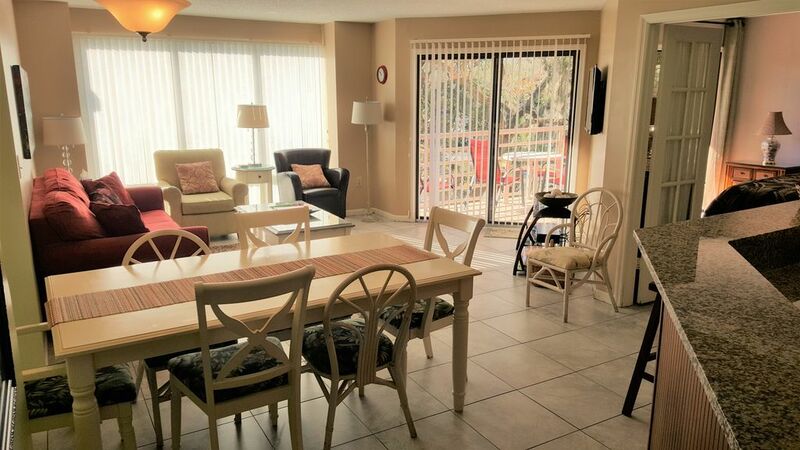 Although this condo DOES NOT have a view of the ocean, it's an easy 150 ft. walk to the beach! That's a SAVINGS of at least $200-$300 from an ocean view condo. Wake up each morning and head down to the pool or beach with your coffee and enjoy the view!! Or enjoy the beautiful live oak trees near the balcony and the draped Spanish Moss on them-very southern indeed! Our condo has beautiful custom bathroom and kitchen cabinets with gorgeous granite counter tops. Tiled floors with a few accent rugs, and NO DIRTY carpeting! Very close to any amenity you would need! Master Bath has soaking tub, walk-in shower, and a double sink granite vanity. Second Bath has standard tub/shower, single sink granite vanity. It's a short walk of about 200 ft to the ocean, depending on the tide. 3226 Villamare is located in the beautiful oceanfront Villamare complex. Even though our condo does NOT have a view of the ocean, the beach is just an easy 200 ft stroll away! The sunny view faces south, and includes beautiful Live Oak trees draped with Spanish Moss. Villamare has it's own private Health Club, free for all quests, equipped with indoor pool, hot tub, sauna, universal gym, free weights, ellipticals, treadmills, and bikes. Villamare has wonderfully landscaped gardens and lagoon areas surrounding the entire complex! Our family had a wonderful stay over the 4th. Hilton Head itself was super busy but the condo gave us the privacy and quiet we were looking for! We will be back! Excellent location and very clean! Ive stayed at villimare previously, this place is always amazing. The location of this condo is very convenient to the beach and pool. The owner was MORE then amazing to work with, very sweet and down to earth. The condo is stocked VERY well, a lot of times when you go out of town there is a lack of pots, pans, and cookwear, not in this condo. We will defiantly revisit, as well as recommend clients, friends, and family members to this condo! Thank you for our stay, we really appreciate the friendliness that was offered, and for accommodating us! Linda's place is just perfect! Eight teachers really enjoyed ourselves! So nice to be able to just walk out to the beach and pool. Perfect location and condo was stocked with absolutely everything we needed! This was our first stay on Hilton Head and we had our two daughters and their husbands with us for a Wedding weekend. The location and amenities were perfect! Leading up to the stay Linda was great responding to my questions promptly and making me feel welcome. A great place that I would definitely return to! Wow! What more can I say! You can tell from the pictures you have seen online that this property will be a pleasure for you and your family to stay in. What you cannot tell and what I want to focus on is the attention to detail and the attitude of wanting to please their customers that is so apparent from the first time you speak with the owners but what truly amazes is the fact that it continues for the whole time you are there. They totally understand that they are dealing with repeat customers if they show the respect that so many property owners forget. They are the best! A great location! Exceeded our expectation in every way. Go fishing, canoeing, or kayaking in the 11 mile lagoon system in Palmetto Dunes.